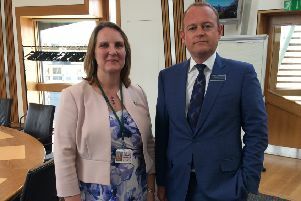 The new �1.6 million SRUC Veterinary and Analytical Laboratory was opened by Mairi Gougeon MSP, Minister for Rural Affairs and the Natural Environment. Photo by Chris Watt. The new Scotland’s Rural College (SRUC) Veterinary and Analytical Laboratory, at the Moredun Research Institute at the Pentlands Science Park, was opened last week by Mairi Gougeon MSP. Wayne Powell, principal and chief executive of SRUC, said: “Animal health is a cornerstone of a thriving rural economy and the new laboratory offers a step-change in disease surveillance for the whole of the country.